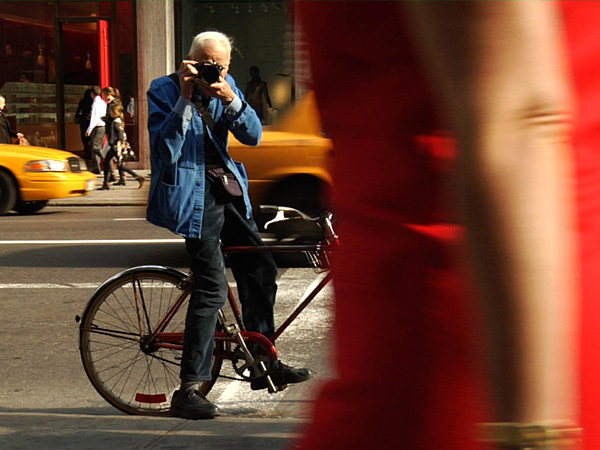 There are many occasions in this film when one begins to wonder: “Is Bill Cunningham actually, clinically, mad?” Never in the course of a human life-time has so much energy and enthusiasm been expended on a subject that many would regard as trivial, superficial or blatantly commercial – the fashion industry. After watching this documentary by Richard Press, one could be forgiven for thinking that fashion is the vital force that drives civilisation. Among its miraculous qualities, fashion has bestowed on Cunningham the gift of eternal youth. At 82 years of age, this veteran photographer continues to churn out fashion spreads, street style montages and social page snapshots for the New York Times. Nowadays he may be found on the Times’ website giving a commentary over a slideshow of his own images. We have already become acquainted with this world through films like The September Issue, Valentino: The Last Emperor and The Devil Wears Prada, but it is a different place when viewed through Cunningham’s eyes. Where a figure like Anna Wintour, the all-powerful editor of Vogue, comes across as perennially grim and uptight, Cunningham is like a child confronted with a pile of Christmas presents. Perhaps the secret is money. For Wintour, fashion is a multi-million dollar operation, with the success and reputation of Vogue depending on the support of the big couturiers. She has to make them feel they need her more than she needs them. This means that a certain image has to be maintained, a sense of reserve and aloofness. It is a carefully constructed pose in which Wintour’s own fashion choices are being constantly scrutinised. Cunningham’s personal style consists of a blue shirt and pullover, with a bright blue jacket that he bought for $20 in Paris. It’s the same coat worn by the municipal street cleaners. When it rains he dons a black plastic poncho that he patches up with gaffer tape. The only Bohemian touch is a beret, worn for convenience rather than chic. Every aspect of Cunningham’s life is monastic. He lives on deli sandwiches and cheap coffee – “The cheaper the better!” he quips. His long-term abode is a tiny apartment in Carnegie Hall with neither kitchen nor bathroom. He sleeps on a makeshift bunk surrounded by filing cabinets filled with photos and negatives. His clothes are hung on metal coat hangers hooked over the filing cabinet drawers. Cunningham’s preferred mode of transportation is a bicycle, which he rides around from morning till midnight, snapping pictures on street corners, or attending social functions where he never has a drink or a bite of food. “I eat with my eyes,” he says to a hostess who tries to hand him a plate. While this documentary was being made in 2009, Cunningham and his neighbours, including the 96-year-old photographer, Editta Sherman, were in the process of being evicted from Carnegie Hall, where many of them had lived since the 1940s. This adds another note to the ‘end of an era’ theme. There will never be another Bill Cunningham, and never another group of artists residing in this famous concert venue. As we trail back over Cunningham’s history his attitude towards money seems ever more remarkable. For an independent fashion magazine called Details, he worked day and night, routinely producing hundred-page spreads and refusing to accept payment. When a cheque was forced upon him he would solemnly tear it up. It’s mind-boggling to hear someone talk like this today, particularly when immersed in an industry in which money and glamour count for everything. Cunningham is in love with fashion to the point of obsession but manages to dissociate it from grubby commerce. He rails against those who see fashion as a mere “frivolity”, defining it as the armour we need to survive the reality of everyday life. The only time Cunningham’s cool deserts him is when asked about his attitude towards religion. Brought up a Catholic, he goes to church every Sunday, saying that it provides “good guidance.” Beyond that he is defensive: “I find it very important, for whatever reason I don’t know.” Something about the question upsets him deeply, some painful memory or recollection of childhood. But he bounces back with a joke and a grin. Freudians might feel that Bill Cunningham is the greatest example of psychic displacement (Verschiebung) one could ever encounter. We may never know what he is avoiding with such relentless energy, but it has resulted in a record of New York life that will be admired by generations to come, not simply as a parade of passing fashions, but as a unique chronicle of the city’s cultural history. USA. Rated PG, 84 minutes.